Do you like aromatic and Middle-East type of smell? If you are a fan of it, then you must try Creed Mellesime Imperial. Creed Mellesime Imperial comes up with a combination of exotic and oceanic style. 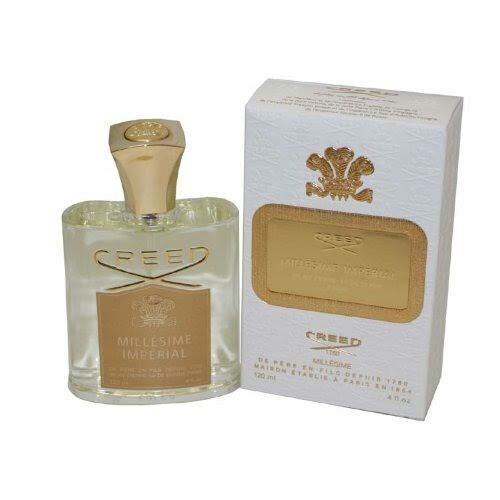 Creed Mellesime Imperial was created by Creed perfumery company. This product brings us a remarkable experience of Middle East. It is released back then in 1995, which has passed a long time ago. But in the market, Creed Millesime Imperial still finds its fans. Many of them are inspired by the aroma and its special shiny metallic bottle that contain it. Especially due to the metallic bottle, it is really eye catching. The price itself is quite high considering all the luxury that Creed Millesime Imperial offers. Even so, many people still consider it as one of the must-try perfume. Are you one of them? Will you like Creed Millesime Imperial with all of its characteristics? Creed is a Paris-based perfume house. It was originally established as a tailoring house in 1760 and has become a favorite fragrance company, thanks to all its products. Designers of Creed has already invented 78 perfumes in their fragrance base starting from 1980. In 2010, Creed celebrated its 250th year by opening its only US store in Manhattan; this store now will begin the expansion that will flourish the world of perfumery. Take a look : Creed Aventus vs Millesime Imperial. Creed Millesime Imperial is a newly invented product from Olivier Creed Sixth Generation. Usually, Creed perfume house prefers the classic oceanic or flower style perfume, but now they start over and try to invent a new one. The perfumer Olivier Creed is trying to initiate with a fruity and sweet aroma followed by the bombardment of marine and pungent smell. Some people even comment that there are sour, salty, and sweet moments wrapped up at once. Creed Millesime Imperial has successfully made a powerful combination but not even bothering us to smell it throughout the day. The design of the packaging itself is probably inspired by the Middle East oceanic style. The bottle is entirely shiny metallic with a little touch of yellow color and golden in the middle. It looks simple, but also mesmerizing. Apart from the bottle, the box is quite beautiful with Creed label printed on its surface. Some might want to collect these box and bottle, as it is one of the charming factors that Creed Millesime Imperial offers to you. Even though it is mainly salty and marine, but they also add some fruity aroma in it. The fruit aroma is probably put in with just a little proportion as the marine aroma is still more dominant. The vanishing sensation is quite pleasant for you who love oceanic but wanted to get some sweetness in it too. Creed Millesime Imperial opens with fruity notes and sea salt as the top notes. Both brings ocean and sea moment at best. Then it is followed by fruity stuff like iris, mandarin orange, Sicilian lemon, and bergamot as the middle notes. Closed with the sea, woody, and musk notes as the base notes. The longevity is moderate, but some people consider it as a great lasting perfume. The sillage is quite soft, though, as it gives some shy approach right from the beginning. Sillage is rather weak, expensive item. Check the best price for Creed Millesime Imperial here!